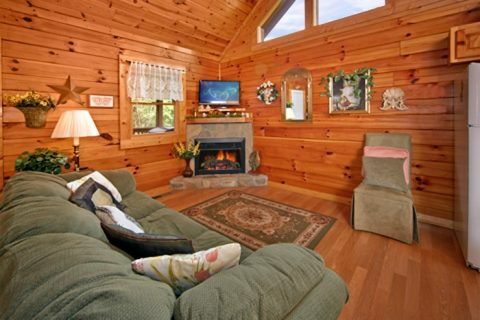 "Angel Haven," offers guests a beautifully decorated cabin in Mountain Park Resort Pigeon Forge, TN and provides the perfect lodging for a mountain retreat with swimming pool access and WiFi Internet. 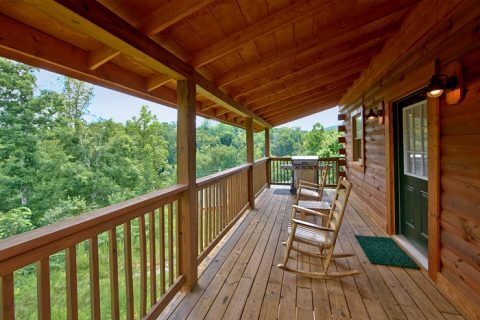 This cabin is the perfect chance for couples seeking an action-packed weekend away from the everyday! 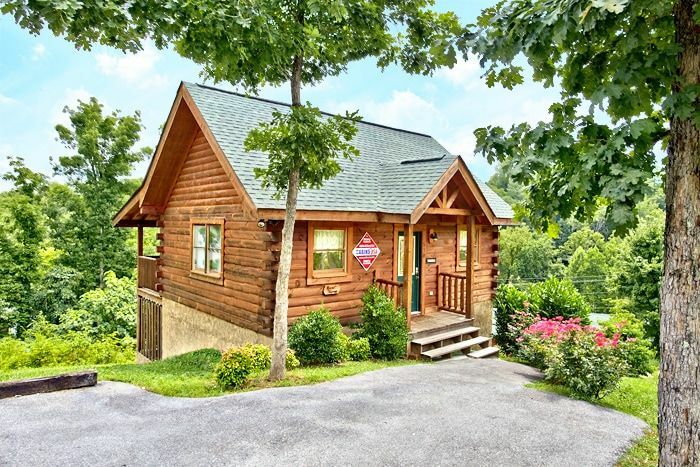 This cabin rental's Downtown Pigeon Forge location offers guests plenty of fun and exciting entertainment options, but you may never want to leave the romantic ambiance of your cabin. 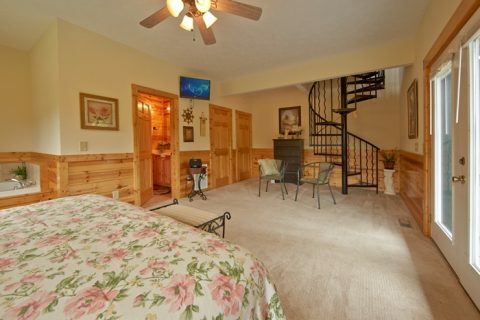 Descend the spiral staircase and you'll find an impressive master suite with a king-size bed and luxurious jacuzzi. 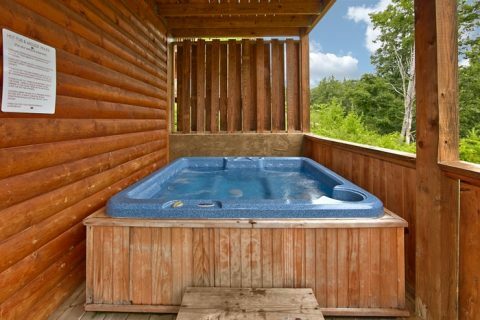 A private doorway leads to the lower covered deck where you can relax in the warm waters of the hot tub. During the cooler months, couples can cuddle by the gas-log, stone fireplace as they watch their favorite movie with some freshly popped popcorn. There's plenty of entertainment options to enjoy at your cabin as well. 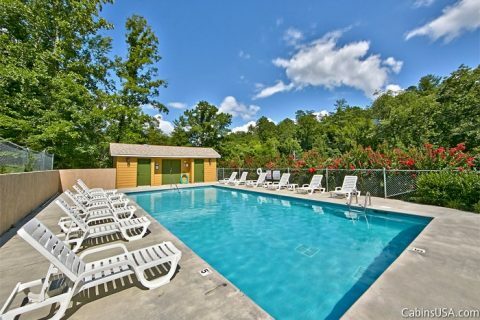 In the summer, visit Mountain Park Resort's outdoor swimming pool for some fun in the mountains. 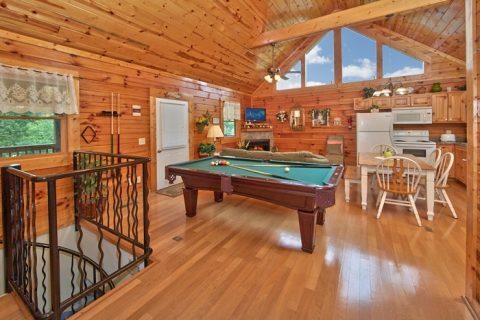 On rainy days or in the cooler months, you can enjoy some fun inside your cabin with the pool table. The cabin's WiFi allows guests to share photos and stories with friends back home via social media as well as to stream the latest movies and games. 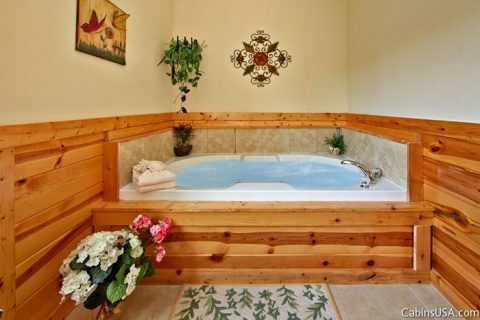 Your cabin also provides practical features for a relaxing, convenient cabin stay. The fully equipped kitchen allows you to eat whenever you're ready - no matter how early or late. 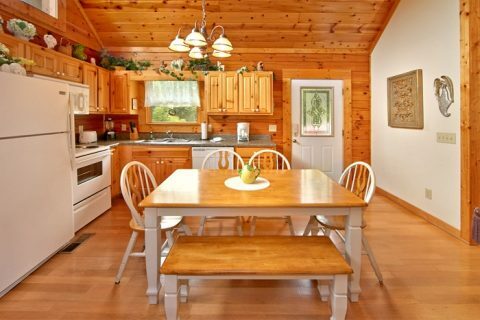 Enjoy a country cookout in the mountain air on the cabin's grill. Additionally, there is a queen sleeper sofa, for small families needing a cabin rental sleeping up to 4 guests. "Angel Haven," a great 1-bedroom cabin rental with swimming pool access in Mountain Park Resort area, provides the perfect choice for making your honeymoon, anniversary or romantic escape to the Smoky Mountains truly memorable. Book online and enjoy a 15% online discount!